Some of the best fun I had in grad school was following up on some unexpected results along the way. In many cases, things that don’t work are merely dead ends. It can be especially vexing if something that “ought” to work craps out. Many times, you just recover starting material- it’s as if you are asking your molecules to do something that they politely decline to do. Sometimes, something does indeed happen, but not what you want. You can often learn from this how to tweak conditions to get your desired product. If it sounds time-consuming and painstaking, then I have described it appropriately. I was trying to make what looked like a very simple compound using a really simple, straightforward route. Ha. This is something only a new graduate student could say without tongue firmly in cheek. You try the obvious things, and you might even expect them to work. But to think that anything is simple and straightforward the first time you do it is a mistake. The molecule, and the starting materials I used, are represnted below. The reaction is written backwards; this is the customary way of saying this is what I plan to make out of these other things. We call this diagram and mode of thought 'retrosynthesis'. What we mean is that if we combine the stuff on the right side of the arrow, in the the right solvent at the right temperature and for the right amount of time, we ought to get the molecule on the left. I didn't get the molecule on the left. For days, it looked like I got nothing. I would run an analytical technique call gas chromatography/mass spectrometry- if you watch the TV show CSI, they use it all the time, and get completely unambiguous results in a few minutes. Yeah, right. I did the analysis on a drop of reaction mixture taken from the flask, and I'd see my product in the analysis, or at least the results were consistent with the product I wanted. But when I tried to isolate the compound, I got almost nothing. As I said, it isn't surprising to get either starting materials, or some product you do not want. But my results didn't add up. The analysis said what I wanted was the only product in the mix. Yet I recovered almost none. As an experienced scientist, I would now roll with this. I might be a little frustrated, but I wouldn't worry. Sometimes things don't work that look like they should. Sometimes weird stuff happens. But as a new graduate student, any serious difficulty had me questioning my intelligence, competence and sanity. The obvious guess was that I was loosing the product in the isolation step. This is pretty easy to do- often separating components of a reaction mixture is difficult. And if the molecule you want is fragile, this has to be taken into consideration, or you can easily destroy all your hard work. But it was frustrating. Each time, no matter how I varied how I did the reaction, I'd see analysis that suggested that there was nothing but what I wanted in the pot, but when I isolated the single component, however careful I was, all I recovered was an absurdly small amount. What the hell? Associated with each peak is a mass spectrum, a recording of the masses of fragments of the molecule. A sample for the molecule dodecane, a straight hydrocarbon chain is shown below. The fragmentation pattern is essentially a fingerprint for a given compound, as long as the instrumental conditions are reasonably similar. This can tell you the molecular weight of the compounds separated by GC. My compound of interest, who came out of the GC portion of the instrument at 6 minutes, has a mass of 155. This was another reason that I thought I had the goods, because this matched the MS results for my peak. On the extended run, at around 25 minutes, off came a much larger peak. The relative sizes of peaks in a GC trace tells you the relative amounts of compounds in the mixture. So part of the mystery was unravelling- I had something else in my mixture, apparently making up the bulk of the reaction product. When I checked the mass, it was 310- twice that of the target. The pattern of little lines in the MS was telling, too. Chlorine has more than one isotope that exists naturally, one a bit more massive than the other. Two major isotopes exist in nature in a very specific ratio, and any compound containing chlorine will show a pattern in the MS that reflects this. This also gives a way to know how many chlorine atoms are in a molecule. My peak at 6 minutes showed a molecule with 2 chorine atoms, just as expected. The peak at 25 minutes was from a molecule with 4. I began to think that there were two of my product coupled some way. It still didn't explain why I was getting no product to speak of, even the wrong product. Again, I feared I was loosing the product during isolation. I went back to my flasks. A by-product of the reaction diagrammed above is the combination of the displaced bromine (Br) atoms, and the counterion of the sulfur, which in this case was sodium ion, Na. Counter ions are important, but in chemical reaction equations or retrosyntheses, we often leave them out because they rarely get involved directly in the reaction. So in the reactor, I had what I assumed was a bunch of NaBr, sodium bromide. This was expected. I just decanted away the solvent, expecting it to contain my product. NaBr is soluble in water, like NaCl (or table salt). I figured I would dissolve away the salts, the try and recover any other stuff that formed in the reaction. To my surprise, the salt did not dissolve away. A little fiddling, and I realized I had some organic solid. Perhaps the mysterious molecule of mass 310? I could not find any solvent that would dissolve more than a trivial amount of the solid. This is an unfortunate fact in chemistry- lots of things are insoluble, and when they are, this fact limits the kinds of analysis and further chemistry that you can do. Still, something dissolved enough to show up in my GC/MS spectra. I needed further tests to figure out what it was. I found that benzene would dissolve it a little, so I boiled the residue in benzene for a while, and it did dissolve. As I cooled the solution, little hexagonal plates of something began to crytallize out, shimmering little sparkles flashing as the compound fell out of the benzene. This might be my mystery compoud. I knew that getting crystals would allow me to have xray diffraction done, which could definitively tell me what I had. When I gathered up the crystals and weighed them, I was even more excited, because a lot of the missing material that I could not account for had been accounted for by finding the molecule that I had mistaken for salt. The leftover benzene was sent through the GC/MS. One peak, at 310. I ran the thing for several hours to make sure there wasn't a later surprise, but nothing else showed. Since I had several days that would elapse between giving the crystals to the crystallography and getting back a structure, I sat down and drew what I thought it might be, if it was indeed my mysterious mass 310 product. I imagined various ways of coupling two pieces, but most of the ones that seemed likely would not quite give the right mass. The one that fit the best, I thought, was a 10-membered ring shown below. 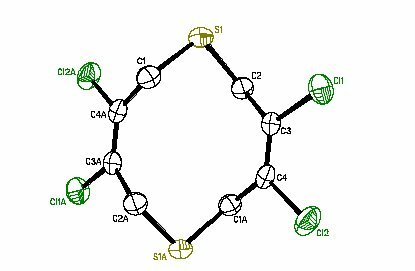 There is a lot of lore in chemistry about the likelihood of forming anything other than 5 or 6 membered rings. Smaller rings are too strained, and the ends of molecules that could form larger rings flop about so that they'd never find each other and couple. So this molecule seemed fishy. Still, it fit. A few professors I showed it too just shrugged. They didn't think it was likely, but not impossible. In any case, the data would come back and I would know. One professor declared that it was all but certainly NOT a ten membered ring, and spent a couple of hours proposing things that I had already considered and rejected. Including the idea that the molecule dimerized in the GC/MS instrument. Perhaps it did, but this didn't explain the pile of hexagonal crystals that formed in my flask. One last adamant foot stomp from him, and I excused myself politely. I figured it must not be what I thought, so I would just wait and see. I had nothing to gain by getting stuck on one structure, when I would just have to defer to the data anyway. I confess that my first thoughts were the glee I was going to have showing Professor Know-it-all the structure, because there was no arguing with it. I also realized that this would be publishable, precisely because it isn't what one would guess would happen. The crystallographer knew how few examples there were in the crystal databases (I forget now; it might well have been none). Publications are the currency of science, and the quicker I got some out the door, the quicker I could graduate. This was a dead end, as far as my main project was concerned. But an unusually fruitful dead end, in that I went back and characterized the molecule fully, and got a paper out of it. And I learned a lot about not thinking that prior precedent is a perfect guide, about using things that go wrong to learn, and about never giving up when there is clearly something interesting or unusual going on. One reason this unusual molecule could be even more interesting is that it has 2 sulfur atoms in a ring- I think that in the right hands, it might bind to heavy metals, like mercury, and so might be good for further chemistry or even environmental cleanup. The chlorine atoms could be a point at which the molecule could be made soluble, or attached to a support, using pretty standard chemistry. I didn't get a chance to follow any of these possibilities, but now, since it is out there for the person who wants to follow up, I hope someone will. I have had other papers published, but this one is especially sweet, because it came out of nowhere and was completely surprising. For anyone near a good college library who wants to see, the reference is Heterocycles, 57 (12), 2373-2381 (2002).